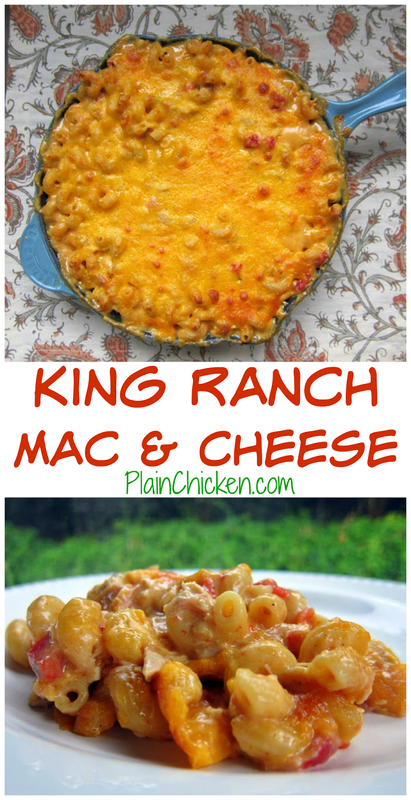 King Ranch Mac and Cheese Recipe- best dish ever! Pasta, chicken, chicken soup, sour cream, Velveeta, cheddar and Rotel - so addictive! He asked me to make it again, twice, while we were still eating it! This recipe is from the January 2012 Southern Living magazine. I made a note to try this back in January, and I am kicking myself for waiting so long. This was SO DANG GOOD! I mean really, really, really good. I want to eat this every day! This makes enough for about 6 people. We ate it for dinner and I ate leftovers for lunch. It was just as good reheated. I could eat this every week. I can't stop thinking about it! Make this ASAP; I promise you will love it! Prepare pasta according to package directions. Drain, set aside. In a large Dutch oven over medium-high heat, combine dried minced onion flakes, Rotel tomatoes, and Velveeta. Stir constantly for 2 minutes, or until cheese is melted. Stir in chicken, cream of chicken soup, sour cream, chili powder and cumin. Add cooked pasta and stir to combine. Spoon mixture into a lightly greased 10-in iron skillet or 9x13-inch pan. Top with shredded cheddar cheese. Rotel? Velveeta? Chicken Soup? Sour Cream? Man, it's got to be good. Thanks for sharing. Pinned. Oh my, this says DELICIOUS all the way! This sounds outstanding Steph, email coming with a question. Wondering if it would freeze well? I'm looking for freezer meals to stock up on before baby...maybe if I froze it before the baking part? The mac and cheese looks really good, but my question is - where did you get that skillet, I really like the looks of it. This is the BEST mac and cheese! my family LOVES it! I've made it since I found it in that SL mag!!! HIGHLY recommend it! Going now to buy stuff to make this. It looks delicious!! OK, it's in the oven. With a small tweak; I used ground beef. I've been eating plenty of chicken lately and wanted a change. It felt like it would taste fine (a test nibble proved me right). Walmart has a huge number of spices in the Mexican aisle (we have that in CA, not sure about elsewhere). I was able to snag a little bag of cumin for $0.78 for 3/4 oz. which is way better than the grocery store at about 1/2 million $$ for 1 oz. Sour cream is way cheaper and so is CHEESE! So I was able to justify making this for hubby and I... and we love leftovers, so it's awesome. I'm going to make an apple tart dessert I found on Pinterest today. I can't wait to eat! Made this tonight and it was soooo yummy! I doubled the recipe to feed my large crew, but it was super easy and delicious!! This was a great recipe! Made it last night and the husband loved it. We had it for lunch today as well and it was just as good reheated! a friend made this for us last night for dinner; my father-in-law just died. It was absolutely delicious! So glad that my vegetarian daughter and her boyfriend can't eat it, because that means there is more for me and the hubby! 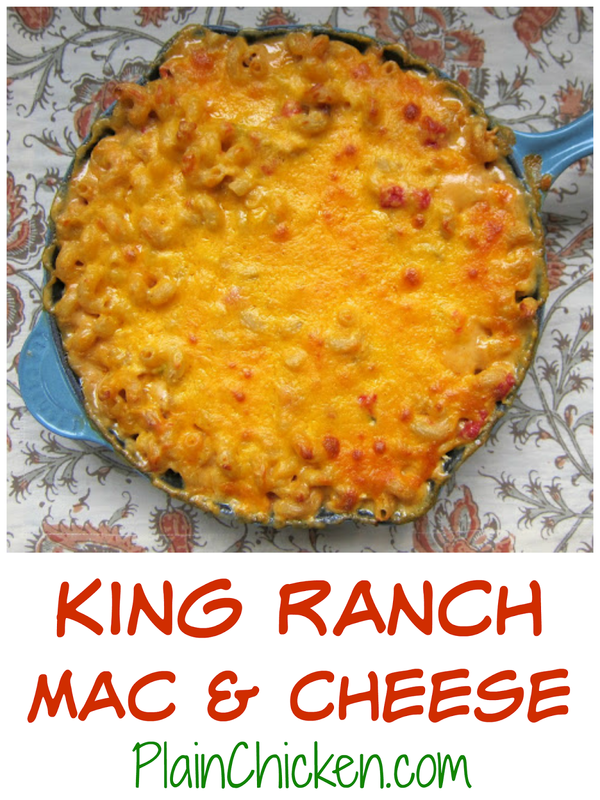 This SERIOUSLY looks like the king of all mac & cheeses ever made! Completely drool worthy.. I made this the other night. I used the "mexican velveeta" instead of the regular. It was good, but a little much. So next time i'll juse the regular. Still good though! The hubs loved it! I fixed this for supper last night, and used 2 cans of chicken (because I had them)- VERY EASY and tasty too! The menfolk requested that it be put into the rotation. Kady - you can use the same pot you boil the pasta in to make the chicken mixture. Enjoy! Do you think you could make it without adding any meat to it? Like leave it the same and just leave out the chicken?